One of the features of Flutter is a possibility to create apps in record time. However, it is very important to write Dart code properly and to use the best practices, Effective Dart, from the beginning. There are some good tools and packages that help you to apply best practices quickly. Dart has a static analysis tool. Static analysis allows you to find problems before executing a single line of code. It’s a great tool used to find possible bugs and ensure that code conforms to style guidelines. When you use IDE to develop an app, Flutter tool analyzes the project’s Dart code and keeps you in a safe place. For example, when you define FloatingActionButton and forget to implement onPressed, then IDE warns that the param onPressed is required. You can also run flutter analyze in your terminal to check your code. This tool is a wrapper around the dartanalyzer tool. All default lint rules that are used for Flutter by IDE are listed here. From the image above you can see that some of the lint options are commented out. But they might be useful for your project. To enable them you can create analysis options file in your project. For this, you need to place analysis_options.yaml at the root of the package, in the same directory as the pubspec.yaml file. Here you can enable/disable linter rules, enable stricter type checks, exclude files for linter check and more. The full list of supported lint rules with documentation is always updated here. You can copy-paste all of them in your analysis_options.yaml. 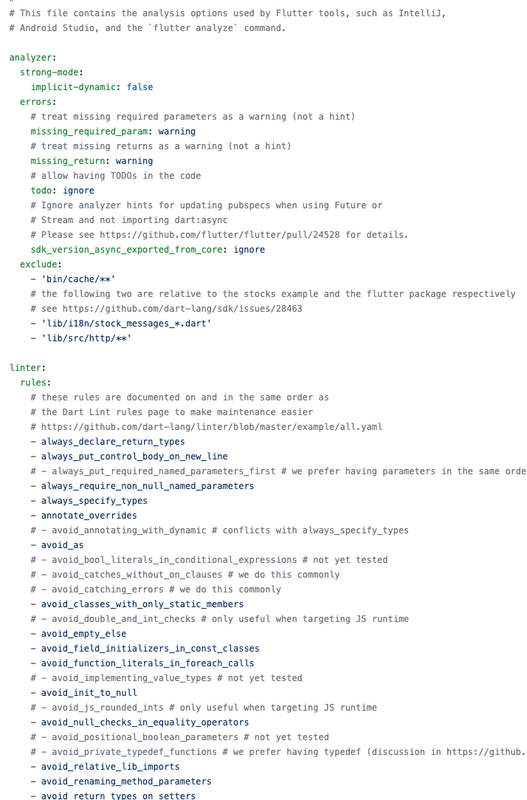 Or you can have a look at the analysis_options.yaml with rules that are following the Effective Dart guide. Don’t forget to run flutter packages get to update dependencies. And now it is time to hack away! for silencing the rule. This function may be used to ignore a particular Future.